Poppy Medley 30x30cm coloured pencil on sanded card. This painting is from the May Plant Parade challenge on Wet Canvas. I cropped one of the photos and painted the underpainting in my usual way but this time using water solouble neopastel and water to cover the paper. I have used the neopastels for the under painting on several oil pastel paintings and it works well for me. Initially I planned to do this painting in oil pastels, but something made me decide to use coloured pencil which I hadn't used for quite a while. Definitely starting to look like flowers now! Stage 3 is finding the changes in plane and lights and shadows on the petals by dividing the larger masses into smaller masses. The light through the petals is starting to show. 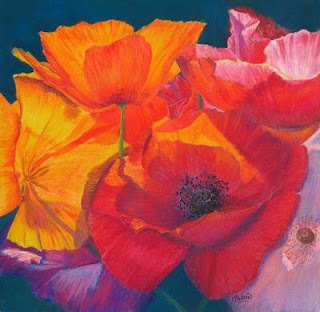 Stage 4 is more of the same - splitting the masses and really looking at the colours and pushing them and putting in that all important centre of the main poppy. I enjoyed painting this one and the coloured pencils worked well on the sanded paper which did not use up the pencils as much as I thought they would. This is absolutely gorgeous! And interesting to see the stages it went through too. Thank you! such juicy colours. Loved that you take me through your process too. Thank you Lynn for your comments. Coloured pencils are good for clean colour.